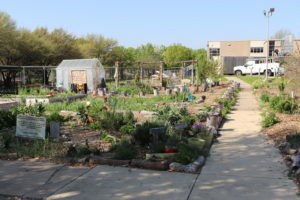 “The 10th anniversary of the Promise of Peace Garden (POP) promises to be a year of abundance,” founder Elizabeth Dry said as she walked through the garden at Bayles Elementary naming the diverse plants that are already flourishing this spring. Tuesday morning, herbs like mint, oregano and cilantro were thriving in the sun. Dry, along with parent and volunteer gardener Elizabeth Morgan, were preparing bedding pots for lemon cucumber seeds, a favorite of Dry’s that she had just purchased. Beto, the neighborhood cat, stopped by for a peek at the plot. He often oversees the labor of love performed in the garden. Another neighbor, the grandmother of a Bayles student, came by to offer an avocado tree and a ginger root plant. Dry’s vision for peace gardens 10 years ago when the first garden was conceived was to create a context for people to come together, and to form connections between folks who are often disconnected. 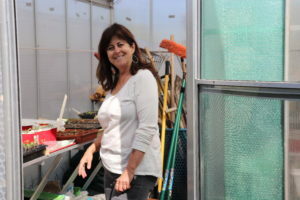 Low income families are not always comfortable connecting to other socioeconomic backgrounds, but all hands are equal in the garden. Additionally, there are so many activities in the garden to enlighten and educate young people that community gardens are a major educational tool — activities that instill knowledge in a child that can’t be learned from a text book. Besides learning to produce food and help one another, the garden establishes environmental literacy. POP also supports “Soup It Forward,” a non-profit organization that encourages everyone to show love and kindness by sharing a pot of soup. To help fund the project you may purchase a soup kit made up of produce from the garden for $20. Contact Dry at 214-240-9420. Okrapalooza is POP’s biggest annual fundraiser. The Reeves Family Farm in Princeton, Texas, (about 10 miles east of McKinney) will host this year’s event on September 15. The farm produces some amazing okra and the Palooza will include local renown chefs preparing a variety of okra dishes and a “farm to table” dinner served in the fields. Tickets go on sale April 1. POP has been transporting an average of 500 lbs. a week from farm to farm and neighborhood to neighborhood. They recently received an awesome truck donation from a wonderful community member. Why does Dry believe that this anniversary year will be the year of huge abundance? Because funding and support for Promise of Peace Gardens have already poured in and along with that comes more opportunities to educate and more to produce. For more information about what POP does, visit promiseofpeace.us.